​The VideoRay Crawler attachment is so simple and effective it’s ridiculous. It has been specifically designed for the Pro 4 Float Block and is an essential attachment for obtaining stable video on submerged surfaces in difficult conditions. This no-tools-required accessory easily attaches in seconds – put it on or take it off as needed in the field and start inspecting. 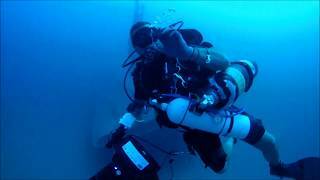 No difficult “flip & roll” techniques are required to adhere to a surface – simply get under the surface and use the powerful suction of the ROVs vertical thruster to latch on and roll effortlessly while obtaining stable video. Ideal applications for the VideoRay Crawler attachment include ship hull inspections, potable water tanks, and any submerged structure with a rigid surface. The hull crawler attachment will not work on Pro 3 float blocks.